Due to our growth within the Industry we require an an Accounts Assistant,to add to our established team. Ordering of stock, sending purchase orders and dealing with suppliers. Liaising with Acorn Supervisors to ensure works have been completed, Issuing Sales invoices, allocating payments and chasing outstanding payments. Balancing both Supplier and Customer Accounts. Balancing Credit Card Statements and making relevant payments. Checking Subcontractor invoices and arranging relevant payments. Assisting Financial Director and Senior Accountant with weekly financial reporting and month end procedures and Company Insurances. The ideal candidate will be able to work well under pressure within a fast paced environment, carrying out a variety of tasks and be able to prioritise workload. Basic admin skills essential. Training can be given to the right candidate including Accountancy Training if desired. Would also suite someone qualified or working towards their AAT. Salary Is dependent upon experience. Hours of work Monday to Friday 8.30 to 5.30pm with Saturdays on a rota basis usually 1 in 6 Saturdays. Salary 18K to 24k Depending upon experience. Acorn Event Structures wins “Best Staging Supplier” at the Event Production Awards. Staging and temporary structures specialist, Acorn Event Structures, has won the award for “Best Staging Supplier” at Event Production Awards in London. 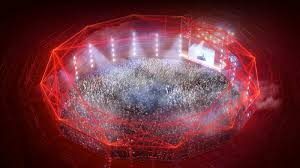 Designed to honour the staging supplier delivering the most iconic stage setting, the award for “Best Staging Supplier” was awarded to Acorn for having “created genuine impact and demonstrating real innovation” for the introduction of the Super Structure at Creamfields festival. 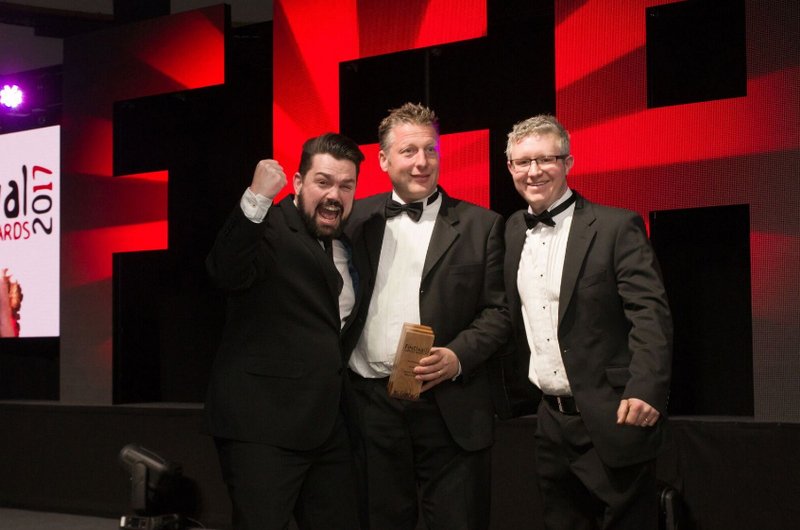 Recognising and celebrating the hard work and achievements of key suppliers and contractors to the industry, the Event Production Awards took place alongside the Event Production Show, the leading event for the UK’s live event sector. Acorn MD Andy Nutter said “We’re delighted to win another award for our Super Structure – we’re experiencing more demand for innovative structures which meet increasingly ambitious production specifications. 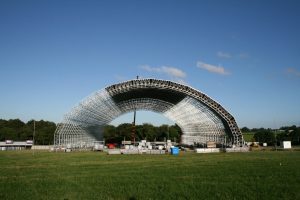 The reaction to the Super Structure has been phenomenal, demonstrating how the introduction of the Super Structure addresses a specific market need for temporary structures which push the boundaries and provide foundations for great events”. 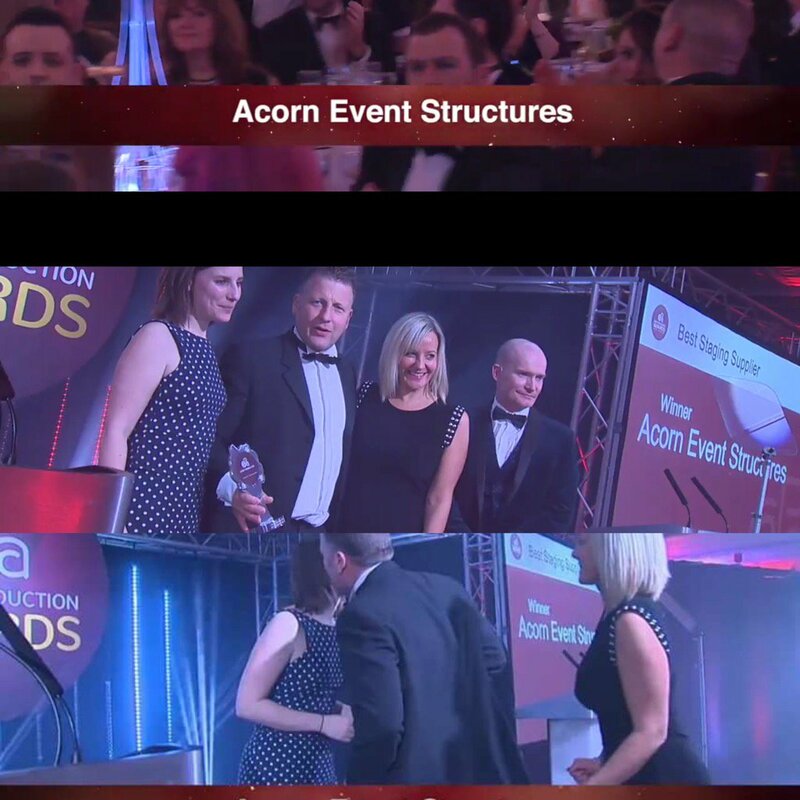 Images from video capture of Acorn MD’s Andy & Rebecca Nutter accepting the ‘Best Staging Supplier’ award. A close up of our latest award. Acorn win “Best Stage” at Festival Supplier Awards. 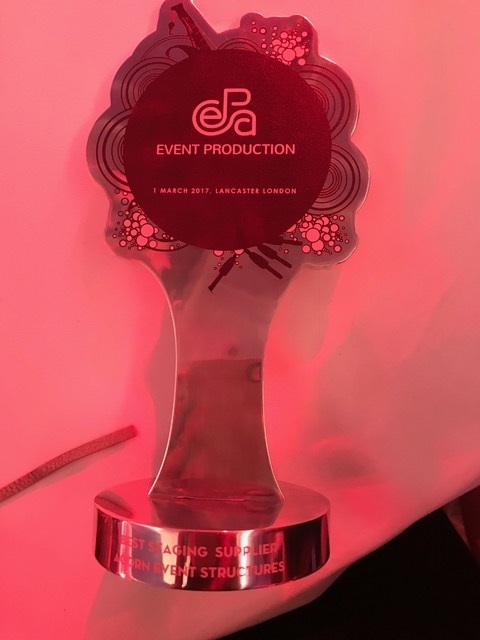 We’re delighted to have scooped another yet award, this time “Best Stage” at the Festival Supplier Awards for our work at Creamfields festival. Celebrating the creativity and innovation of outdoor events suppliers, the Festival Supplier Awards recognise the achievements and hard work of festival suppliers in the UK festival industry. Andy Nutter, MD, said “We’re delighted to receive recognition for our Super Structure – we’re experiencing more demand for innovative structures which meet increasingly ambitious production specifications. 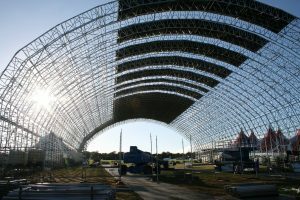 The reaction to the Super Structure has been phenomenal, demonstrating how the introduction of the Super Structure addresses a specific market need for temporary structures which push the boundaries and provide foundations for great events”. Managing Director Andy Nutter (middle) and Event Electrical Manager James Pashley (right) proudly received the award on behalf of Acorn Event Structures. Acorn at the Grand Tour! The Grand Tour – the new Amazon exclusive show featuring Jeremy Clarkson, Richard Hammond and James May of BBC Top Gear fame – roared into Whitby for it’s third episode. Featuring the usual wit and banter we’ve come to expect from the team, it was the seaside town of Whitby that was chosen to play host for the first UK show in the new travelling format. Acorn Event Structures, working for producers W Chump and Sons Production, erected a marquee base with ramps and stairs for the now famous Grand Tour marquee tent to set on in the picturesque Whitby harbour. You can view our range of ground support structures and the various applications these can be used for here on our website. Make sure to catch up with the episode, exclusively on Amazon Prime. We’ll update you on Acorn’s further involvement as the series continues. Acorn wins NASC Innovation Award! Acorn Event Structures wins top industry Innovation Award at the National Access and Scaffolding Confederation’s AGM. Acorn Event Structures is an Innovation Award winner in the 2016 Inaugural National Access and Scaffolding Confederation (NASC) Scaffolding Production awards, scooping the award for their £1.8M 50m (w) x 20m (h) x 90m (l) temporary event structure at Creamfields festival this year. There were eight entries for the inaugural biennial NASC Scaffolding Production Innovation Award – launched this Summer to celebrate the very best developments in new scaffolding materials and products from inventive NASC members at the forefront of change in the scaffolding industry. Speaking about Acorn, the judges said, “Acorn came through in creating an innovative structure using an innovative product. Their aim is the help clients delivery world-class, unique and memorable events – specialising in innovative, temporary scaffold event structures. Their brief was to push the boundaries of festival design. It took months of collaboration and design, and the effect was to give every festival goer enjoyment of the premium technical production and high end immersive technology. It is an exceptional product borne out of determination to reach solutions in close liaison with a manufacturer and client. The judges made their decision calling the project “innovation at its best””. Vote Now for Acorn Event Structures to win “Favourite Staging Company” in the TPi Awards 2016. Acorn Event Structures speeds into Summer! 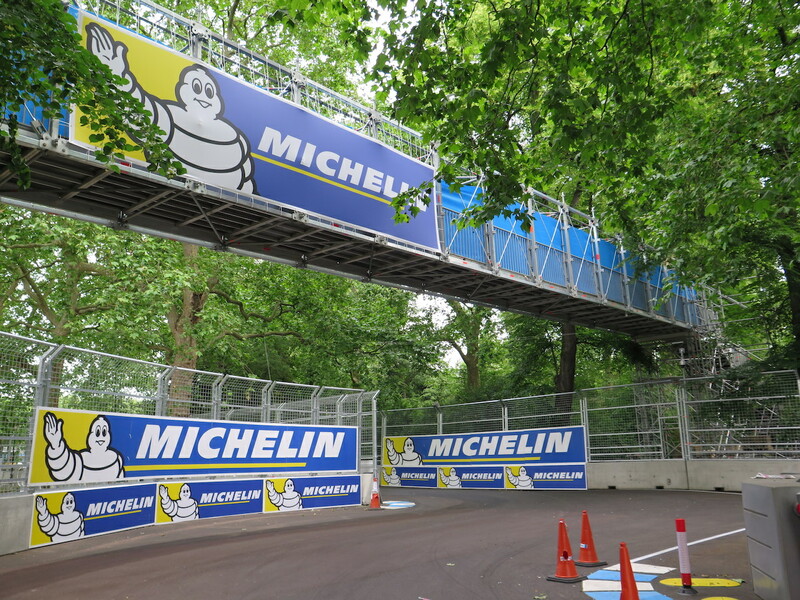 Acorn has a well-established history of providing temporary structures to prestigious motor racing events and, in June 2015, the company serviced two major sporting events.